At Tiny Town Nurseries, we believe that children should be supported and enabled to make healthy choices. Meal times are a social event and one, which should be captured as much as possible. 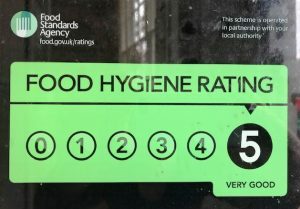 All staff are required to undergo Basic Food Hygiene training. The Nursery Cook, and anyone else who covers in her absence, hold a Level 2 Food Hygiene and Safety for Catering. We cater for all special dietary requirements, food allergies and preferences. Tiny Town Nurseries are inspected by Environmental Health and both sites have consistently high standards, receiving the top award since opening. 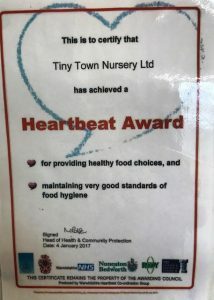 Tiny Town Nursery Warwick have received the Heartbeat Award, meaning we are providing health food choices and maintaining very good standards of food hygiene, all of which is verified by the local authority. Breastfeeding can take place in the nursery if required.